Ars Technica's Arscoin is an educational cryptocurrency. Bitcoin is far from the only game in town when it comes to cryptocurrencies. 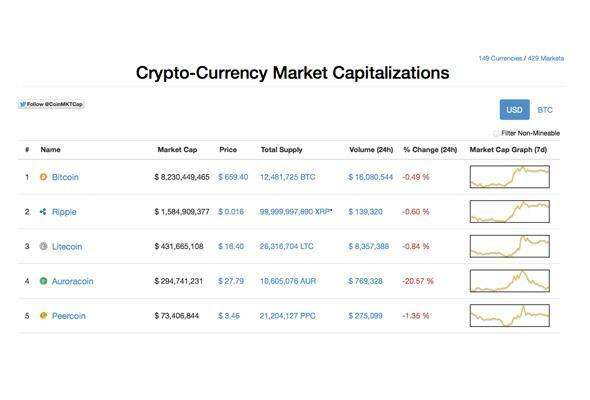 Photo from Coin Market Cap. Future Tense covers a lot of cryptocurrency news because the topics are interesting but also complicated. It’s hard to know exactly what the implications of cryptocurrency are and who should be using it, if anyone. But keep in mind that the code that underlies bitcoin, the world’s biggest and oldest cryptocurrency, is open source. That means that “altcoins” can use the bitcoin code as a jumping-off point to develop their own currencies. To figure out what it takes to start a cryptocurrency, the staff of the tech blog Ars Technica started arscoin. Business editor Cyrus Farivar led the initiative. He writes, “As the new year began, I found myself writing about several new (and often ridiculous) altcoins … It got me thinking: if anyone can just up and create a new altcoin, how hard can it be?” Because it’s for education, the arscoin system is locked down so people can’t exchange arscoins for goods outside Ars Technica channels. But they can use them to buy things like colorful usernames on the Ars site or digital username hats. You also pay to change or remove your username color or hat. Arscoins, like any altcoins, are worth whatever the market will bear. This is worth emphasizing: they’re worth whatever someone is willing to pay for them, whether it’s $5, $500, or $5 trillion. One evening early in our experiment, I asked my wife what she would trade for 5,000 Arscoins. Her answer: “A kiss?” Boom! A market had been created. The Ars Technica team went from puzzling over the bitcoin source code to a make-your-own altcoin service called Coingen.io to mining and setting up a storefront that accepts arscoins. “After experimenting with Arscoin, we learned that it’s fairly easy to get a cryptocurrency going,” Farivar writes. But that doesn’t mean you should. The piece points out that more altcoin currencies means less “digital scarcity,” aka less value and usefulness. But it also notes that making altcoins easy to create could lead to interesting microeconomies and more diversity. If it’s all still seeming abstract and esoteric, join the arscoin community and mess around.